III. Natural products as starting points for future anti-malarial therapies: going back to our roots? II. How can natural products serve as a viable source of lead compounds for the development of new/novel anti-malarials? Guantai and Chibale then review several approaches from outside the field of malaria that “could be considered in enhancing the potential of natural products to provide or inspire the development of anti-malarial lead compounds,” including: drug combinations; dual drugs/drug hybrids; metabolism and metabolite identification studies; molecular modeling and docking tools; natural product-derived pharmacophores (group of atoms in the molecule responsible for the drug’s action) and template-based virtual screening; natural product databases; and target-identification and reverse pharmacology. PubMed recently posted several articles from a 2011 supplement to Malaria Journal devoted to natural products for the control of malaria, so I’ve taken the opportunity to look at the entire issue. Edited by Hagai Ginsburg of The Hebrew University of Jerusalem, and funded with contributions from the African Network for Drugs & Diagnostics Innovation, Department of Primary Health Care at University of Oxford, Institut de Recherche pour le Développement, MMV – Medicines for Malaria Venture and University of Cape Town, the supplement surveys a number of topics related to the use of natural compounds in the development of antimalarial treatments. I’ll address the articles one at a time, starting with the editor’s introduction. In this introduction, supplement editor Hagai Ginsburg and Eric Deharo of the Université de Toulouse and the Institut de Recherche pour le Développement argue for a revisiting of old approaches to the development of antimalarial drugs. Researchers at the University of Zululand, University of Cape Town, and University of KwaZulu-Natal analyzed crude extracts and specific isolates of three medicinal plants used by the Zulu people as treatments for malaria, for activity against Plasmodium falciparum (one of the parasites that causes malaria in humans): Mimusops caffra, Mimusops obtusifolia, and Hypoxis colchicifolia. The team verified anti-malaria activity of M. caffra in particular, which though not as high as that reported for the standards (chloroquine and artesunate), was found to be dose dependent, and with low toxicity levels, and encouraged continued exploration of M. caffra in managing malaria in traditional medicine. “Malaria is one of the major health problems in tropical Africa, South-east Asia, Central South America and Oceania. Despite the various efforts by governmental and non-governmental organizations aimed at eradicating the disease, malaria is said to kill a child every 30 s. Malaria cases have been reported in other areas of the World that were previously considered eradicated of malaria. In Africa, herbal medicines are an important part of the culture and traditions of its people. Researchers at Haramaya University and Addis Ababa University undertook an ethnobotanical study centered around the potential and use of traditional medicinal plants by pastoral and agro-pastoral communities in the Babile Wereda district of eastern Ethiopia, with a goal of setting up of conservation priorities, and preservation of local biocultural knowledge with sustainable use and development of the resource. Working with traditional herbalists, the authors identified 51 medicinal plant species used for 54 human ailments, in addition to some used in vector control. Aloe pirottae, Azadirachta indica and Hydnora johannis were the most cited and preferred species. A high percentage (71%) of the preparations are made for the most common human health problems of the area, including internal parasites, diarrhea, malaria, pneumonia, abdominal pain, dermal infections, eye diseases, and infections of the skin and subcutaneous tissues. Investigators from the South African Medical Research Council, CSIR and University of KwaZulu-Natal undertook a study to establish whether any South African ethnomedicinal plants used traditionally to repel or kill mosquitoes demonstrate effective mosquito larvicidal properties. The authors tested 381 crude plant extracts, consisting of plants found native or naturalized in southern Africa, for their larvicidal effect on Anopheles arabiensis. 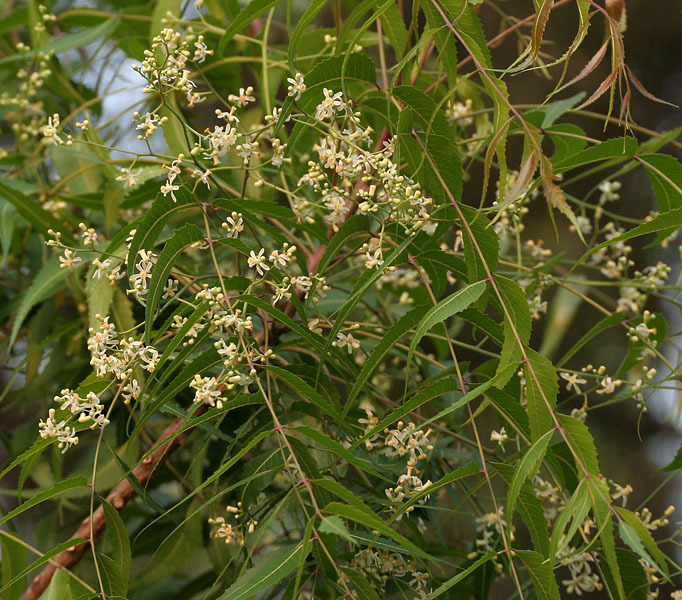 They successfully identified one plant, Toddalia asiatica, that demonstrated superior larvicidal activity and that is now being further studied with the goal to isolate the active compound and develop a malaria vector control tool. Researchers at Università degli Studi di Milano, Università degli Studi di Cagliari, Università degli Studi di Torino and Laboratoire de Biologie Moléculaire undertook a screening study to evaluate the anti-plasmodial activity of aromatic plants traditionally used in Sardinia against malaria: Myrtus communis (myrtle, Myrtaceae), Satureja thymbra (savory, Lamiaceae), and Thymus herba-barona (caraway thyme, Lamiaceae). The authors found evidence for the use of essential oils for treating malaria and fighting the vector at both the larval and adult stages, opening the possibility for further investigation aimed at the isolation of natural products with anti-parasitic properties. Researchers from the Universidade Federal do Amazonas (Brazil), Farmanguinhos (Brazil), Universidade Nova de Lisboa (Portugal) and Instituto Oswaldo Cruz-Fiocruz (Brazil) compiled an extensive catalog of phytochemical studies of medicinal plants used to treat malaria in traditional medicine from the Comunidade dos Países de Língua Portuguesa: Angola, Brazil, Cape Verde, Guinea-Bissau, Mozambique and São Tomé and Príncipe. A detailed table lists the studied species, tested parts and scientific data from vitro and in vivo research. Tagarelli G, Tagarelli A, Piro A. Folk medicine used to heal malaria in Calabria (southern Italy). J Ethnobiol Ethnomed. 2010 Sep 18;6:27. Researchers at Istituto di Scienze Neurologiche-CNR identified folk medical cures that were used by the Calabrian people for the treatment of malaria, as evidenced in writings produced between the 19th and 20th centuries. The authors identify 53 plants used by Calabrian people to treat malaria, and note that some of these plants are still currently used in Calabrian folk medicine to treat various diseases.